On behalf of Rolonda Burks, Christina Witt, and members of Rural Medical Programs at The University of Alabama, we strongly urge the Alabama Congressional Delegation to support H.R. 2957, the Save Rural Hospital Act. This critically important bill will stop the flood of rural hospital closures that is occurring nationwide and ensure needed access to care for rural Alabama and other rural Americans. Eighty-three rural hospitals have closed and counting, including five hospitals within the state of Alabama alone. An additional 674 facilities are vulnerable to closure—this represents more than one-third of rural hospitals in the United States. In fact, the rate of closures has steadily increased since sequester and high debt began to hit rural hospitals, resulting in a closure rate five times higher in 2016 as compared to 2010. Continued cuts in hospital reimbursements have taken their toll, forcing far too many closures. Medical deserts are appearing across rural America, leaving many of our nation’s most vulnerable populations without timely access to care and causing the economies of rural communities to erode. H.R. 2957 will stabilize rural hospitals by providing common-sense regulatory relief and stemming cuts in Medicare that are causing rural hospitals to close. Additionally, the resolution will create an innovative delivery model that will ensure emergency access to care for rural patients across the nation. Keeping rural hospitals open makes fiscal sense. Critical access hospitals make up nearly 25 percent of acute care hospitals but receive less than 5 percent of total Medicare payments to hospitals. The Centers for Medicare and Medicaid Services actually spends 2.5 percent fewer on rural beneficiaries than it does on urban beneficiaries. Additionally, rural health care can represent as much as 20 percent of a local economy, and rural hospitals are often one of the two largest employers in a rural county. The average critical access hospital alone creates 170 jobs and generates $7.1 million in wages, salaries, and benefits annually. 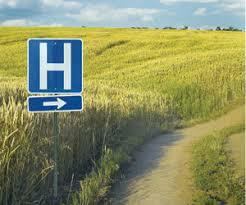 Rural hospitals are critical to 62 million rural Americans. Rural Medicare beneficiaries already face a number of challenges when trying to access health care services close to home. Seventy-seven percent of rural counties in the United States are Primary Care Health Professional Shortage Areas, while 9 percent have no physicians at all. Rural seniors are forced to travel significant distances for care, especially specialty care. Additionally, rural populations as a whole are more likely to be underinsured or uninsured, poorer than their urban counterparts, and experience more chronic diseases. Rural America cannot afford these closures. Please save rural hospitals by supporting H.R. 2957.